The Disaster Management Centre today advised those in the low bank areas of the Kelani River to be vigilant due to the rapidly rising water levels of the river. It was reported that the water level of the Kelani River has increased by 7 meters during the last few days. Further, residents of Wellampitiya, Kolonnawa, Kotikawatta, and surrounding areas are requested to move to safer locations due to the rising water levels, in the area. The Kelani River reached the spill level by last evening, resulting in the flooding of low lying areas. The areas that are inundated are Kelaniya, Talwatte, Nagahamula, Kunukade Junction, Welekade, Pattiwila, Kohilawatte and Henawatte. 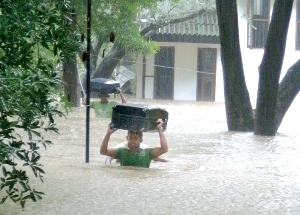 Our correspondents reported that the water level in the Kelani River is continuously rising. Initiatives have already been taken to direct the affected families to secure places. The correspondents said that they were being evacuated with the help of boats.